From Tehran to Berlin: The Goethe-Institut supports the residency of Shirin Barghnavard at the Harun Farocki Institut in Berlin. For three months, the Iranian artist is living in Berlin where she is working on her new film. Shirin Barghnavard has been working without daylight, in a basement, in the company of more than 50,000 kilogrammes of film since last October – not every day, but now and then. The Iranian filmmaker will be in Berlin until the end of January, where she will spend a three-month residency at the Harun Farocki Institut where the films of the artist Harun Farocki, who died in 2014, are stored. “Visiting his archive was one of the best experiences I’ve had during my residency,” says the native of Tehran. Countless rolls of film material from decades of analogue film production – Super 8, 16-mm and 35-mm negative rolls, S-VHS and mini DV tapes – are stacked in the basement of the institute in Berlin’s Wedding district. At the beginning of her career, she had also shot short films on Super 8 and 16 mm negatives. Together with the Goethe-Institut, once a year the institute located at Kulturquartier silent green offers selected candidates the opportunity to live and work in Germany on a scholarship. In a way, it’s a creative stopover. For Shirin Barghnavard it means having time for interviews, filming, meetings with filmmakers and researching in the film archive. “This is a unique opportunity to work on my new film project,” says the documentary filmmaker. The subject of her new film revolves around the complex of nationality that she has been exploring for years. Nourished by her own experience – she lived in Perth in Australia for six years – by discussions about migration, current film productions and political developments in Europe, the topic practically broached itself to her. “It is important to me not to mix the issue of nationality with that of displacement and asylum.” By Christmas, she had recorded 25 audio interviews with various people in Berlin alone, with different backgrounds and very different approaches. The mission of silent green, a former crematorium, is to create new things and this is exactly what the award-winning filmmaker sees as the core of her stay. 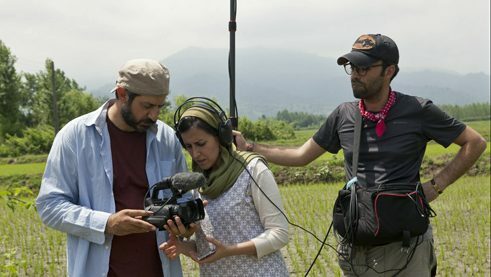 “It allows me to prepare my next short or medium-length documentary.” Although she emphasises that it was not easy to disengage herself from her daily routine in Iran. She was still editing a film by the Iranian filmmaker Rakhshan Bani-Etemad until shortly before her flight to Berlin. Now she is taking advantage of the freedom in Berlin to dive into her new film project far from home, inspired by an unknown environment. She has a small flat in Kreuzberg, works either there or in the Harun Farocki Institut, enjoys the international atmosphere in the city on the Spree with its ever changing array of cultural events. The videos by the US film critic and video essayist Kevin B. Lee contributed to the surge in visual film criticism. The New York Times called him the “King of Video Essays.” He was the first to receive a scholarship for the Harun Farocki Residency in Berlin from January until March 2017 as part of a partnership between the Harun Farocki Institut and the Goethe-Institut. He took on the professorship for the new course of study in Crossmedia Publishing at Merz Akademie, Hochschule für Gestaltung, Kunst und Medien in Stuttgart in the winter semester of 2017-2018.